Thank you for visiting our website. Kenner Discount Pharmacy is locally owned and operated, and we are a reliable source of prescriptions, medical equipment, and supplies in the state of Louisiana. Our team is made up of competent, professional, and amiable pharmacists and technicians who are knowledgeable and well-trained in their fields. You can talk to one of us for all of your concerns, inquiries, or questions, and we will provide you with all the assistance and support that you need. Our pharmacy is an equal opportunity provider. We do not turn our services away from anyone on the basis of age, gender, color, race, ethnicity, religious beliefs, or creed. We provide our services to anyone who needs it with the best of our abilities and uphold them to the highest of standards. 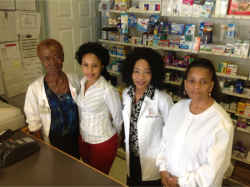 Kenner Discount Pharmacy is located in 3108 Loyola Drive, Kenner, Louisiana 98589. You are free to drop by anytime at your convenience to personally talk with our pharmacists about any questions, inquiries, or concerns. You can also contact us at 504-464-4421.